The Gold 18kW System is a highly reliable, condensing, System gas boiler that has been designed and manufactured by Potterton. This wall mountable boiler is also compact in size to help save you space around the home. 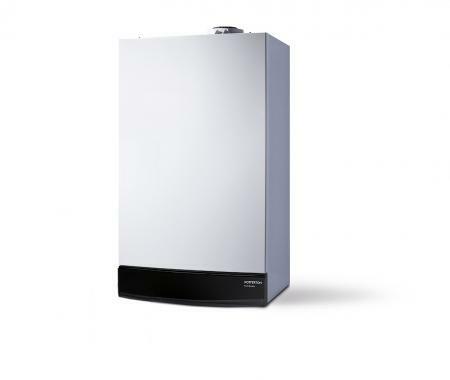 Thanks to a seasonal efficiency rating of 89% and ErP A rating, this is a highly efficient boiler that could help you to save money on your energy bills. An 18kW output rating makes this Gold boiler perfectly suited to smaller homes, with 1 bathroom, that don’t have such a high demand for heating and hot water. Should your home require a higher output, the range also includes 24kW and 28kW models. As a System boiler, this unit sends hot water to the radiators and a sealed hot water storage cylinder. The vital parts of the system are built into the boiler itself, meaning that it’s more compact and easier to service. The many features of Potterton Gold boilers include a pre-plumbing jig to make installation faster, built-in frost protection and flue lengths of up to 20 metres to make the installation location flexible, ideal locations include garages and utility rooms. Backed with a 2 year warranty, you’ll get added piece of mind that this boiler isn’t going to be letting you down.